Mix together the walnuts, sugar, and cinnamon. Repeat with five more filo sheets, layering and brushing each one with the butter. Sprinkle with one-third of the nut mixture. Repeat the process twice, using six mire sheets of filo pastry each time, brushing each sheet with butter and sprinkling the nut mixture over each sixth sheet. Finish with six buttered sheets of filo pastry, and lightly brush the top with melted butter. Trim the edges of the filo, then, using a sharp knife, cut about halfway through the pastry layers to make 20 squares. Bake in a preheated oven at 220℃ (200℃ fan, Gas 7) for 15 minutes, then reduce the oven temperature to 180℃ (160℃ fan, Gas 4) and bake for 10-15 minutes until the pastry is crisp and golden brown. Remove the baklava from the oven. Heat the honey and lemon juice in a heavy saucepan until the honey has melted. Spoon over the hot baklava. Leave to cool in the tin for 1-2 hours. 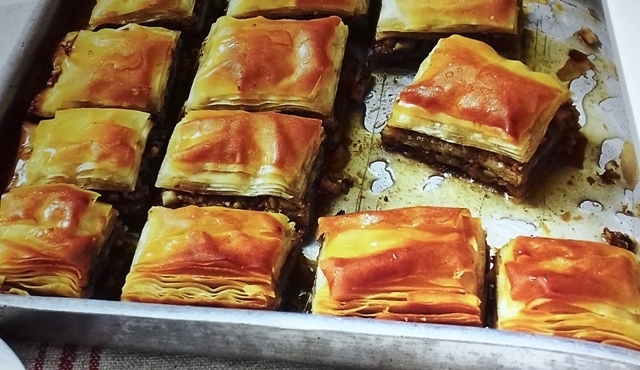 Cut into the marked squares, and serve the baklava at room temperature.